Days of double figure temperatures and a bright sunny afternoon, promised a few hours of successful carp fishing at a council owned lake a short drive from my home this week. 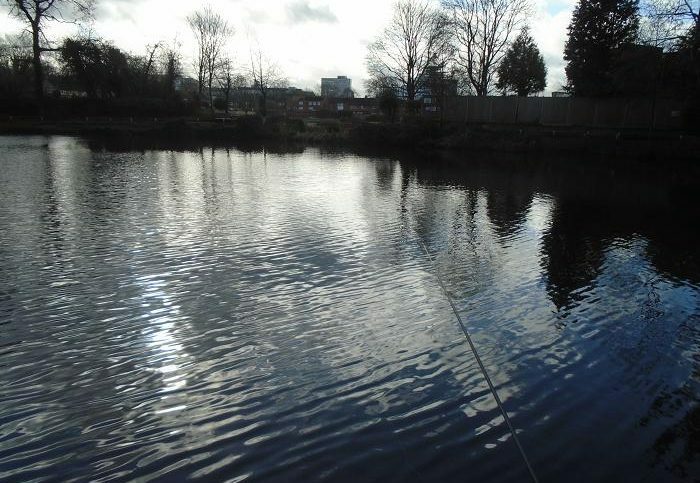 With a car park at the waters edge, it is ideal for the casual angler, although the shallow, silt filled water is not the easiest to fish. Being a magnet for local mums with bread to feed the many ducks and Canada geese, the carp are used to bread being readily available as feed and I arrived with only bread as bait. The council have recently trimmed the trees opposite the top of the island and I set up a float rod to fish through a gap, out into the channel. The float is a cut down antenna pole float carrying about 3 AA, the main line 6 lb and the hook link 4 lb to a size 16 barbless hook. I mixed up a pint of coarse processed bread, adding a teaspoon each of curry powder and the same of vanilla powder, wetting this down to form sloppy balls. With so many ducks and geese around, I waited for an obliging mum to arrive before throwing the balls in three quarters over toward the island. With the ducks preoccupied on the adjacent bank, my feed was able sink onto the silt without being gobbled up by the feathered hordes. 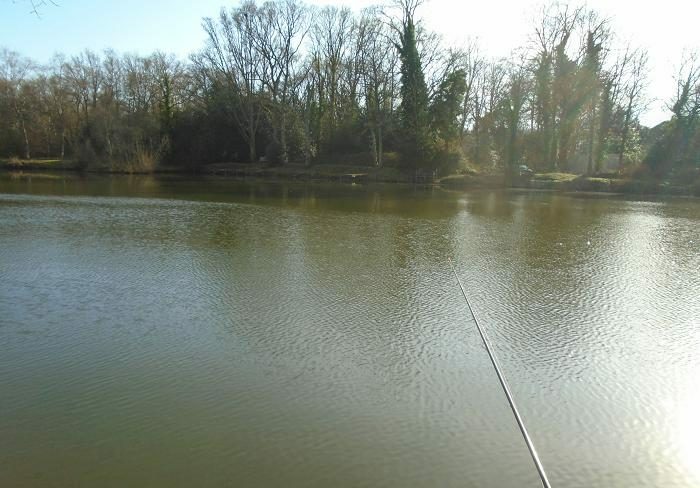 Casting out into the fed area, I sunk the line to avoid the wind drift, the antenna soon showing signs of interest in the double punched 6 mm bread bait fished just above the silt. The float slowly sank away trailing line and I struck hard to lift the sunken line, the rod bending over into an explosive carp, that headed back over to the island snags. This was not a big fish and I held the run without any need to backwind, the clutch staying silent as the carp dashed from side to side, being brought closer to the landing net each time. I have netted several commons to eight pounds from this small lake in the past, but I was happy with this three pounder, my spur of the moment decision to come fishing justified. I now managed to miss a couple of unmissable bites, then striking into a tiny common, which it seems the lake may now be infested with. Back in November I had caught several baby carp, commons and mirrors and here was another nibbling at the bait. 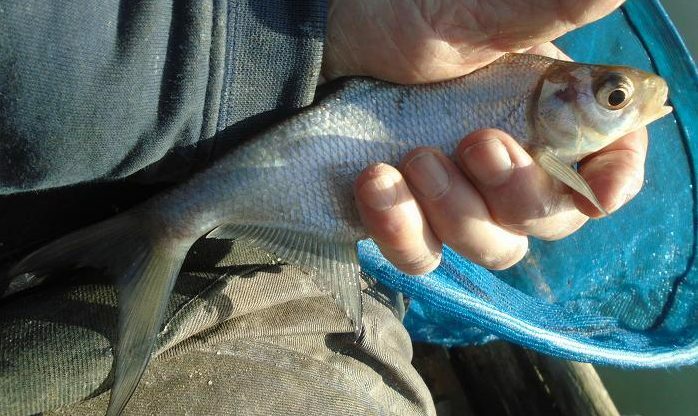 With a few more of these micro carp returned, I decided to mix up some feed in the hope of attracting some of their larger brothers, but the extra, instead of feeding them off, brought in a greedy shoal. Each bite had to be treated like the real thing and striking into thin air, to see a tiny carp spinning on the hook was becoming tiresome. I had gone up to a 7 mm double punched bread pellet, but this was no deterrent, the soft bait easily sucked into their mouths. The float disappeared again and I struck into a running carp. At last. It had been two hours since the last decent fish and this one was fighting harder, making long runs against the reel, stirring up a trail of black mud in its wake, then diving under the bank into the roots, eventually rolling repeatedly to the net. About four pounds, this wild common carp made the most of its extra weight and satisfied my desire to continue; I had been sitting in the shade all afternoon and was now feeling cold. Time to pack up and head home for a cup of tea and a slice of homemade cake. I had just finished scraping the ice from the windscreen of my van, when my friend Peter arrived to join me for the drive to Kingsley Pond in East Hampshire. Peter is a member of Oakhanger AC and I would be fishing on a guest ticket, available at the community shop across the road to the pond. Bright sunshine was burning off freezing fog on the drive and we hoped that the pond would not be covered in ice as it was on our previously abandoned visit. Still shrouded in mist when we arrived, the pond seemed ice bound again, but a thin covering of algae over the still surface proved to be an optical illusion, much to our relief, having both invested a fair bit of mileage to get there. By the time we had arranged the guest ticket and tackled up, an east wind was ruffling the surface, but this did not bother the fish, my first cast following a small ball of liquidised bread, the tip of my float dipping several times before slowly sinking away. The first few casts brought a one ounce roach each put in, then the elastic came out with a better fish staying deep, breaking the pole down to the top two to net it. The size 18 hook dropped out in the net, all the fish so far taking a 4 mm punched pellet of bread offered under 4 g antenna float. 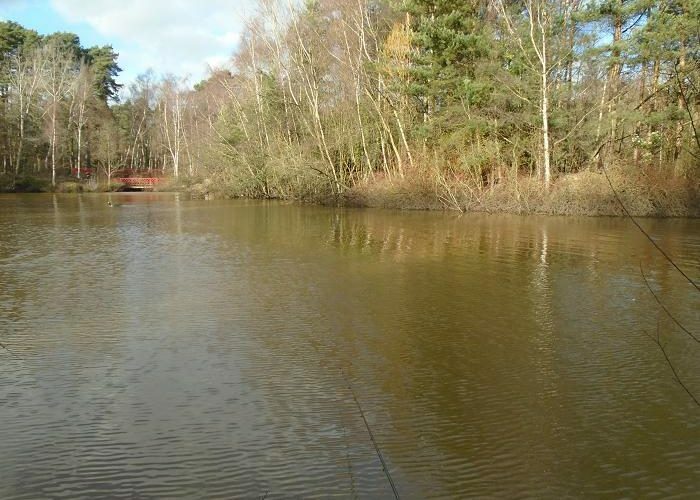 When I plumbed the depth, I found three feet at 5 metres and I fed a couple of small balls along this line 2 metres apart, fishing out in front of me, when the wind dropped and to the right holding back in the wind. 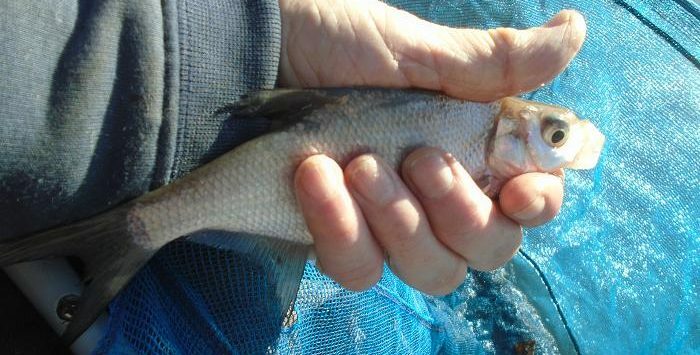 The extra feed began to attract skimmer bream into the swim, the fussy bites reliably resulting in a slow sink away of the float, the slab sided silvers beginning to fill my keepnet. A surprise catch was a golden rudd among the roach and skimmers. 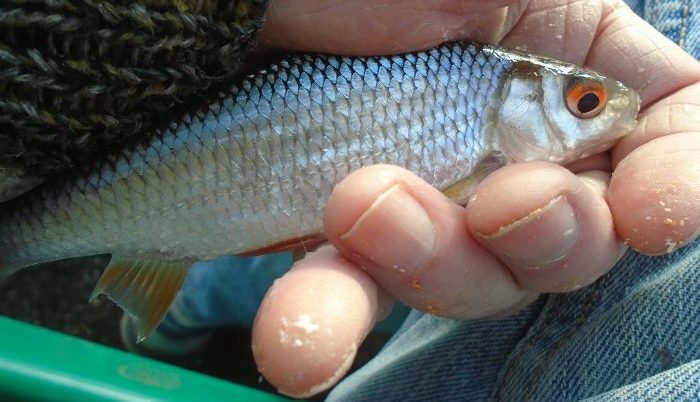 A hard fighting roach/bream hybrid also got in on the act. Peter had been sitting without a bite all this time, his double maggot on a running line waggler rig untouched, until a change from a size 14 hook to a size 18 and a single maggot, produced bites. Shotting the float down close to the tip, improved his chances of hooking fish, although not as effective as the bread punch and pole combination. The down wind feed area was now full of skimmers and a small ball of feed every three fish held them there. We set a time of 3:30 to finish fishing, despite us both catching at a regular rate, one of my largest skimmers coming just before the dead line. 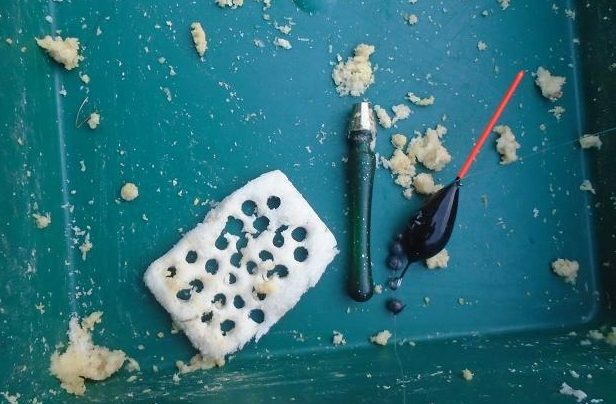 In the cold water the 4 mm punch produced more positive bites, even the skimmers preferring the smaller bait. 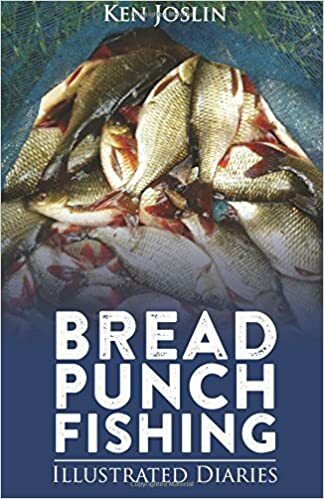 The warm a wind hardened up the punch bread quite quickly and I had to change to fresh slices during the five hour session to avoid missing bites. Considering the frosty start, I was pleased with the end result of about a hundred fish, the punch out fishing the maggot ten to one. Peter was happy with his day, having caught a few nice roach and a decent skimmer, while we sat within chatting distance in the sun. 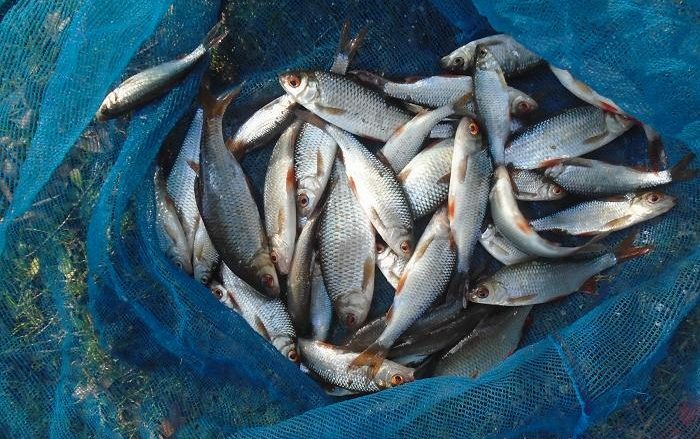 Heavy rain, then snow and ice, followed by more rain, had kept me away from fishing for too long and with a brief gap in the weather today, I took the short drive to my local Jeanes’ Pond in Braybrooke Park, to see if bread punch would coax the roach to feed. Bearing in mind that the pond had been covered with ice, then snow only a few days ago, I was not convinced, that I would catch, but at least I was giving it a go, instead of sitting at home staring out of the window. On my way, I passed through a heavy shower of rain and as I tackled up, force 5 winds were driving a massive black cloud my way, blocking out the mid day sun. Scrambling for my waterproof jacket, I was just in time to avoid a soaking, as sleet filled rain hissed across the pond, keeping me pinned down for ten minutes. No sooner had the rain gone, the sun came out into a clear blue sky, my choice of the north bank being justified by the fact, that the wind would be blowing warmed surface water over to my side. That was theory anyway, the first ten minutes without a bite making me think otherwise. My setup was a light canal antenna float, dotted down to just below the tip, a size 18 barbless hook being tied to a 1.7 lb bottom line. I plumbed the depth, seeing that a shelf dropped down to 3 feet, 4 metres out, then dropped again to 4 feet 5 metres out. I put a small ball of fine liquidised bread over each shelf, fishing over the near shelf four inches off bottom, the 4 mm pellet of bread untouched each time that I lifted out, when the float drifted up to the shelf. Another small ball over the near shelf saw the tip dip slightly, as the rig drifted into the cloud, the antenna silhouette against the surface switching on and off, then off as the float held under. I lifted and was surprised to feel the resistance of a decent fish as the pole bent with the elastic pulled clear of the tip. 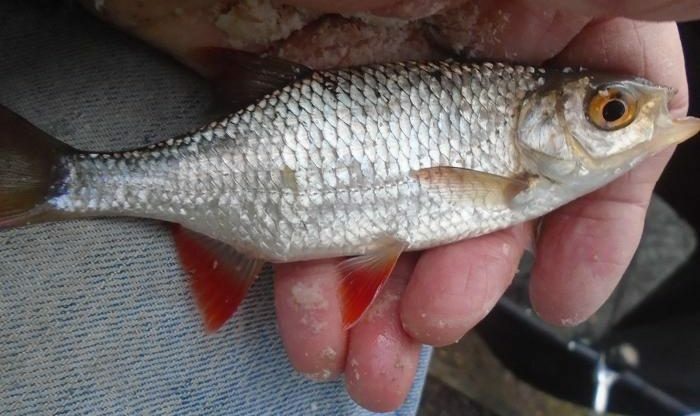 This was a net worthy roach, the bite indicating a much smaller fish. Ice cold to the touch, the fish must have been barely awake, the next bite merely trembling the antenna before holding it down. 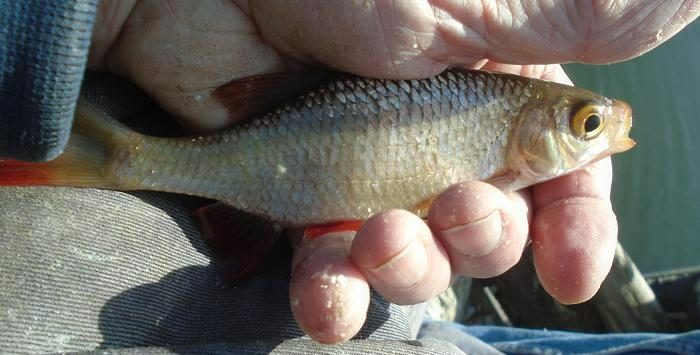 These roach were generally bigger than I expected, considering the feeble bites and I settled into a slow, but steady rhythm of hooking fish, only interrupted by another short burst of rain. The sun was reflecting on the water dead in front of me, moving across to the right as the session progressed, the tiny float tip black against the glare, switching on and off in the surface, a good bite indicator. The inside line went dead after an hour and I added depth to the float, plus another metre to the pole to fish over the next shelf, getting a bite immediately over the feed. 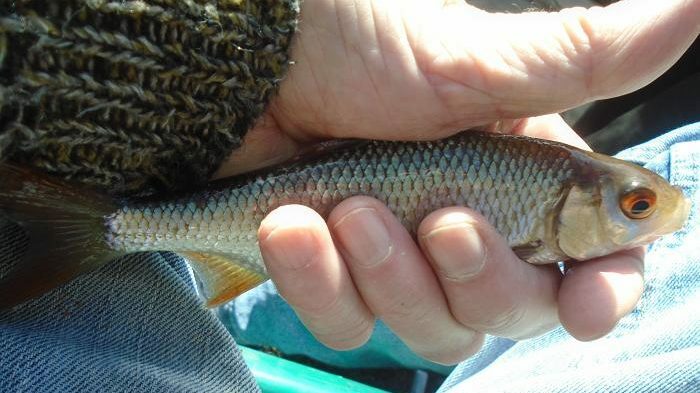 Not a monster, but a hard fighting roach all the same, this one of several that continued to take the 4 mm punch pellet, a step up to a 5 mm resulting in missed bites, rather than bigger fish. Waiting longer for bites, I shallowed up again and came back onto the inside line, resting the swim bringing another good roach. 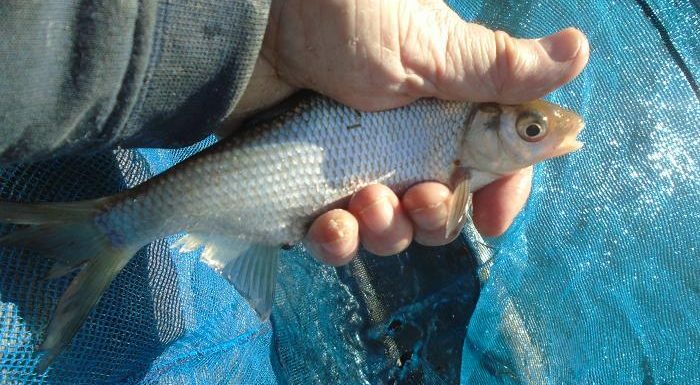 Two anglers had set up opposite me fishing wagglers, but failed to catch, while I steadily lifted small roach from the cold water, the pair gone before the hour. 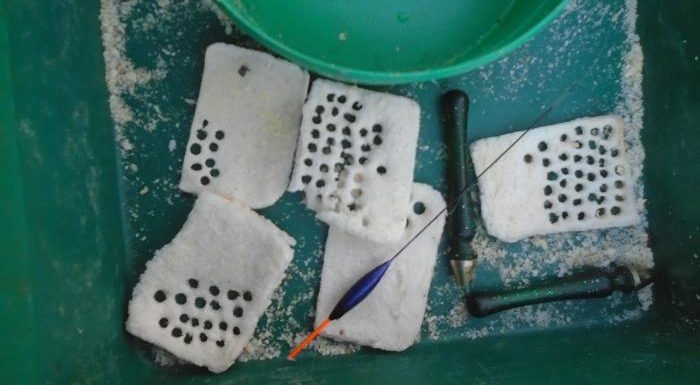 I was now feeding very small balls every fifteen minutes, one to the left and fish to the right, then the opposite, which brought a good bite and two, or three fish each switch. Not speed fishing, but the keepnet was filling. I began catching small rudd on the drop, a sign that the water was warming, then it went dead again. The bites had dried up, so I went back out to the far line. It was very slow, a small fish every five minutes. I had fed the inside and came back over it, but again waited five minutes for a sign of a bite, the float dipping several times before it slowly sank. I struck into a moving fish, that powered away taking out the elastic and I added another metre of pole to follow as it ran toward the old lily bed, putting on side strain, turning it to arc toward the middle. As the fish ran across in front of me, I saw that it was a small pike of about a pound, and unshipped the extra length of pole, drawing the pike across the surface against the elastic to my landing net. 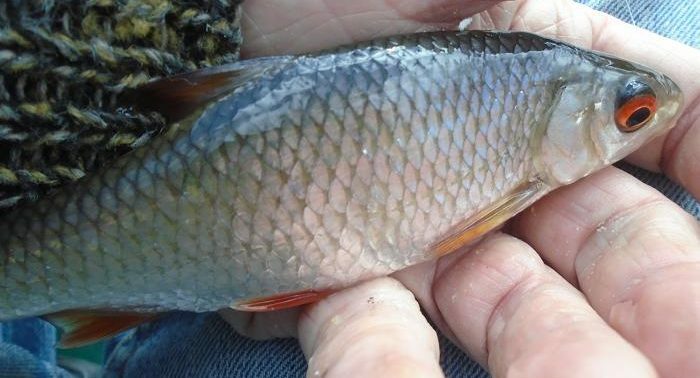 A roach was held across its jaws, which came free when the pike rolled in front of the net. The pike had taken the roach as I struck and not been hooked, dropping the fish by accident, or design. Apart from scale damage, the roach swam off without a second look. I continued to fish, taking a few more small roach every five minutes, or so; maybe the pike was back. It was now 3 pm and the sun was behind the clubhouse, the air temperature dropping away, so I packed up. 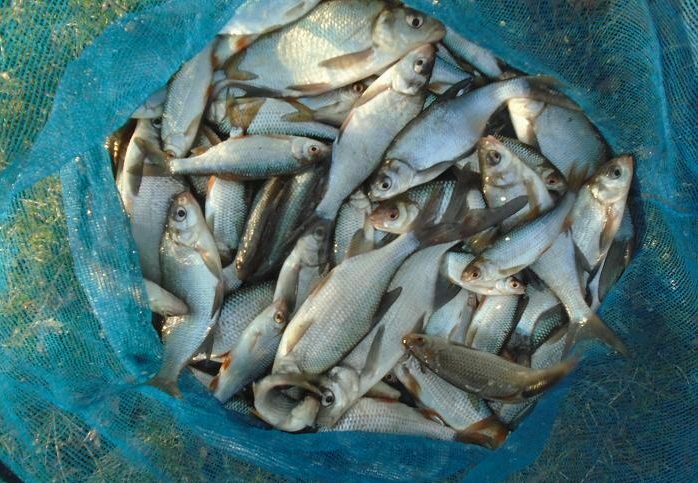 Around fifty silver fish in under three hours, when the bread punch proved its worth in cold water conditions.